I suppose this is really the end. One day, I knew it would come. I could see it on the horizon, the landscape shifting as it was. Now, my heart is heavy. The tears you see are real. Life as we know it is no more. Why? NO MORE BACON! The headline read “Activists: Pigs, chickens, cows have feelings, too.” The story went on to tell the sad story of how farm animals are people, too, and we shouldn’t be eating them. It seems a psychologist at Emory University (of course, it would be a Methodist school!) will be working with a group called Farm Sanctuary on extensive research to demonstrate that “pigs, chickens, cows and other farm animals as more intelligent and emotionally complex than commonly believed.” I bet they’ll be using some of my tax dollars to conduct this research, too. I have to give them credit. At least they’re honest about their intention. The purpose of their study is twofold–“to build broader public support for humane treatment of farm animals and to boost the ranks of Americans who choose not to eat meat.” It’s been my experience that people who begin a study with a stated goal in mind usually go on to prove their stated goal. Funny how that works, huh? And, here I thought it was time for bacon to come into its own. Just as people are discovering that bacon makes everything better. A guy in New York City even opened a “baconery,” which is a bacon bakery. A person can get bacon brownies, bacon cookies, bacon chocolate, bacon bread, and even bacon dog-treats. I wonder if the researchers can do a study on the psychological impact it will have on dogs when dogs discover pigs have feelings, too. 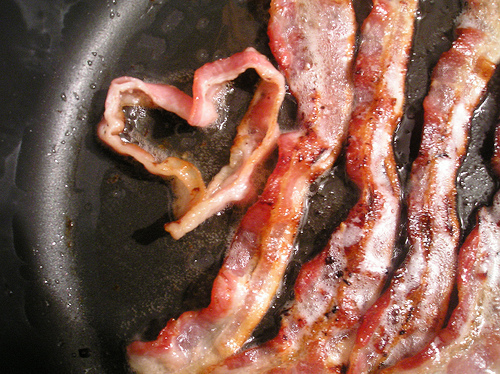 Will dogs be inclined to eat less bacon? Maybe I’ll apply for a government grant to conduct that study. I can’t imagine a life of no bacon–or pork fat in general. Everything is better with pork fat. Just this past weekend, Vanessa made some excellent pulled pork BBQ. I’ve been enjoying the leftovers all week. And, I can’t imagine a life with no breakfast for supper. Yum! There’s nothing better in the cool evenings of fall than the house filled the with aroma of sizzling bacon, scrambled eggs and homemade biscuits. Seriously, a ribeye steak can’t be done better than breakfast for dinner (oh! I forgot. Cows have feelings, too!). I can’t envision a world where I can’t show up at my mom’s some early Saturday morning and not get home homemade biscuits, bacon and sausage. I mean, really, what’s the point? Okay, I’m not writing to throw stones at vegans. If a person wants to eat only vegetables, that’s quite okay with me, but please don’t spend my tax money to prove your point. And, having spent my tax money, don’t expound your “gospel,” tell me how evil I am for enjoying pork fat, and then try to make it the law of the land to do away with it. I get the sense that will be the result of all the studies–pigs (and cows and chickens) are people, too, so it’s sinful to eat them. I’m not prepared to cede the moral high ground to vegans. There are probably a few vegans reading this blog today, and to them I say, “More power to ya’,” but leave my bacon alone. They’ll likely get mad at me. They might even reply to this blog with studies that show how healthy a vegan diet is, and there might be one or two who point out that vegan was God’s original diet plan–that pork is one of those Levitical no-no’s. Who cares? There’s a reason I’m not the perfect pastor! I only ask that you tolerate my indiscretion here. After all, the only thing we’re not supposed to tolerate is intolerance, right? Unless, of course, what I want you to tolerate disagrees with what you think ought to be tolerated. There’s much that can be tolerated these days. Heaven help us if we add bacon to the list of things that can’t be tolerated. Sorry if you were reading today for some deep theological truth. You won’t find it here. Just a sad tale concerning the soon demise of bacon. Depression is setting in, but I think the remedy can be found if I can just get to the refrigerator and start frying some bacon. You’ll have to excuse me now. I’m hungry. It’s my first Sunday in this new appointment (my first, mind you!). Now, I’m no technological whiz by any means, but I can, at least, turn a computer on, create a blog page and monitor facebook. I figure, I’m starting a new appointment, this is the 21st Century, and I want to “do things differently” than my predecessor, so what do I do? I show up my first Sunday to preach and I have no bible or sermon notes. I have only my new tablet computer (nope, not an ipad–that might have been my first mistake), and I’m going to dazzle this new congregation with my technological savvy and read the bible and preach my sermon using only my tablet. This’ll be great! My first Sunday was June 30, which, by the way, is the Sunday before July 4th. The congregation was only having one service (we normally have 3), so the house is packed. Everyone wanted to show up and hear the new guy (yes, that’s right, it’s all about me), and I was ready to impress. The time comes for me to preach. I take my tablet and open my bible app to read the scripture. It opens right where it’s supposed to open. The first sentence of the text is at the bottom of the screen. I drag my finger across the screen to move the page…and it skips a page. I page it back. It goes back to the opening screen. There’s the first sentence of the text. Okay. I read it again…swipe my finger again, and…it skips a page. I can’t read my text. No, I didn’t memorize it. All I can think is…well, I can’t write what I actually thought (no, I’m not the perfect pastor), but let’s just say, my temperature jumps a few degrees and my face reddens. A third attempt and I get the same result. My bible app on my tablet actually has page numbers. On this morning, it decides to jump from page 1091 to 1093. No page 1092, which is where the rest of my text for the morning resides. I do the only thing I know to do. I step out of the pulpit, step down to the congregation, and there, on the front row, a first-time visitor sits holding one of the pew bibles open to my chosen text. He reaches out, with saving grace, and offers me the bible. How do I know he was a first-time visitor (no, not because he was sitting on the front row)? It just so happened I was standing in the hallway by the door when he came in, and I introduced myself to him. Here’s just one of the funny parts of the story: The man introduces himself as a pastor from another denomination who isn’t preaching this day and decided to visit with us (Seriously?). Anyway, he was my saving grace on my first Sunday. He was actually one of the few people who picked up the pew bible to follow along. All I could think of was how embarrassed I felt, and how embarrassing it was going to be if my tablet failed to open my sermon notes. Luckily, the tablet functioned properly when I got to my sermon, which is a good thing, because I had no back-up plan. I’m sure the guest on the front row was not going to miraculously pull out my sermon notes had the tablet failed. All-in-all, it was a very humbling reminder that God is in control, and he must have figured I needed a little humbling that first Sunday. In case you’re wondering, I’ve carried my old-fashioned bible to the pulpit with me every Sunday since. It always works! So, the second Sunday I show up to preach. I’ve done my work diligently all week, and again, I get my notes ready to preach…on my tablet. We’re back on schedule with three services. I rise to preach at the 8:30 a.m. service, swipe my finger across my tablet, my sermon notes appear, and I’m good to go. I begin preaching, lay my tablet down on the communion rail for a moment, and when I pick it back up…no notes. The tablet shut itself down. Nothing. Nada. Zilch. IT WON’T COME BACK ON! God! Really! You’re doing this to me again? What deep theological statement are you trying to make, Lord? Or, are you just trying to embarrass me in this new congregation? A thousand things are going through my mind. I try to be cool. Can’t show my frustration here. Just gotta’ do what I gotta’ do. I go to plan B (yes, I had a plan B this week, and it did not include any member of the congregation). I was prepared for any eventuality this week. I emailed myself a copy of my sermon, and I just happened to have it on my phone (now there’s a smartphone for you). I pulled my phone out of its holster, swiped a couple of times, and voila, there was my sermon. Do you know how awkward it feels to hold your smartphone in your hand while your preaching? Really awkward. But, it worked. Two Sundays down. Two glaring reminders that I might be a little too big for my breeches. Well, the babies got baptized. It was a memorable moment made even more memorable by IT, and I’m sure that story will get told at the little boy’s wedding, but it reminded me one more time that God is in control, that everything I am and have, I have because of His grace. The Lord took three weeks to remind me that I ought not think too much myself, that there are just too many things beyond my control. I’ve looked around over the past couple of weeks and I can only think how blessed I am to be where I am. It would be so easy for me to buy into the idea that I deserve to be where I am, that I’ve worked hard and earned a spot at one of the best (I think THE best) churches in our Annual Conference. The truth is I don’t deserve to be here. I am here by God’s grace, and He is in control. That’s life, though. None of us deserve anything (regardless of what advertisers tell us). All of life is grace. The Apostle Paul reminds us that what we deserve is death, but what we receive is life in Jesus Christ. I’m wondering if what God was reminding me on these three Sundays was, “What you deserve is IT, but I can take a little bit of water and demonstrate to you and to the world that I make all things new.” Now, that’s what I call grace. Okay, you’ve got my attention, Lord. It’s not about me. I’m sufficiently humbled (for now), and I really can’t wait to see what you have for us next. There are probably a few I’ve missed, but these are practices that every disciple of Jesus Christ should practice at some time or another if he/she desires to grow in their relationship with Jesus Christ. A second characteristic of healthy discipleship is generosity. I won’t go into the details of living a generous life, but I’ll remind myself that I’m blessed to be a blessing. Enough said? I thought so. A third characteristic of healthy discipleship is evangelism. Yeah, this one scares a lot of people away, but a healthy disciple is one who is prepared to share the gospel or show the gospel. This really isn’t as hard as everyone makes it out to be. It can be as simple as inviting a person to worship, or to a service opportunity, or even to a concert. Just invite. It’s still the number one way an unchurched or dechurched person connects with the body of Christ. A fourth characteristic of healthy discipleship is worship. When I say worship, I’m speaking of both corporately worship (we are a COMMUNITY of faith–kind of hard to be a community when we don’t gather Together!) and privately, and regular participation in the sacraments. The fifth characteristic (which is the one I really wanted to write about today) of a healthy disciple is service. Service is, in a real way, as much spiritual discipline, but I think that could be said about worship and generosity, too. 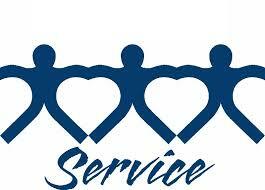 When I speak of service, there is a phrase I like to use: Every disciple of Jesus Christ gives service TO the body of Christ and service THROUGH the body of Christ. Let me unpack that just a little. I have previously written: “My dream is one day to have a principle named after me, and I want it to be known as the 100% rule. You know? 100% of the work of the body being performed by 100% of the disciples of Jesus Christ.” I believe service is the key to connecting new people to the body of Christ, and to sustaining long-term health as a disciple of Jesus. Our service TO the body of Christ is a means whereby we participate in the pastoral care of our local congregation, and we’re all called to “lift one another up.” Pastoral care is all our concern, not just the “pastors,” or those with the “gift” of pastoral care. Pastoral care takes place when I sing in the choir or praise team, and lead the congregation in worship. Pastoral care takes place when I clean and prepare the sanctuary for worship. Pastoral care takes place when I send a prayer card to a shut-in or hospital patient. Pastoral care takes place when I help the office staff fold bulletins or newsletters. Pastoral care takes place when I serve as an usher, or a greeter, or fix the coffee on Sunday morning. Pastoral care happens when I unlock the building and adjust the heating or cooling before people arrive for worship. Pastoral care happens when I carry out the trash. Pastoral care occurs when I operate the sound system. Pastoral care occurs when I contact the first-time guests. Pastoral care occurs when I teach a Sunday school class or bible study. Pastoral care happens when I prepare gift bags for shut-ins, those in the hospital, or first-time guests. Do you catch my drift? That’s right! Every ministry we offer TO the body of Christ is pastoral care because they are tangible ways we support and care for one another, thus building up the body of Christ. Pastoral care is so much more than saying a prayer for sick folks, or holding the hand of a person going through a crisis. It is that, but it is so much more. Where is God calling you to service TO the body of Christ? Then, there is service THROUGH the body of Christ. This is that service that reaches most effectively the unchurched and dechurched of the world. Service through the body of Christ is that ministry that engages in hands-on, life-transforming ways with the least and the lost. It is where the body engages those on the margins, the poor, the homeless, the broken. It is lived out in tutoring programs, in mission trips (locally, nationally and internationally), in food ministries, in clothing ministries, in school uniform ministries, in child-care ministries, in recovery ministries, in financial planning ministries, in home-building ministries, and in a thousand other creative ways that touch people in life-transforming ways. Service THROUGH the body of Christ is that service that builds relationships (face-to-face, hand-to-hand) with unchurched and dechurched people. The relationship is where the transformation occurs, not the service. The service provides the opportunity to build the relationship. Jesus changes lives through service–he changes our lives and he changes the lives of others through us. 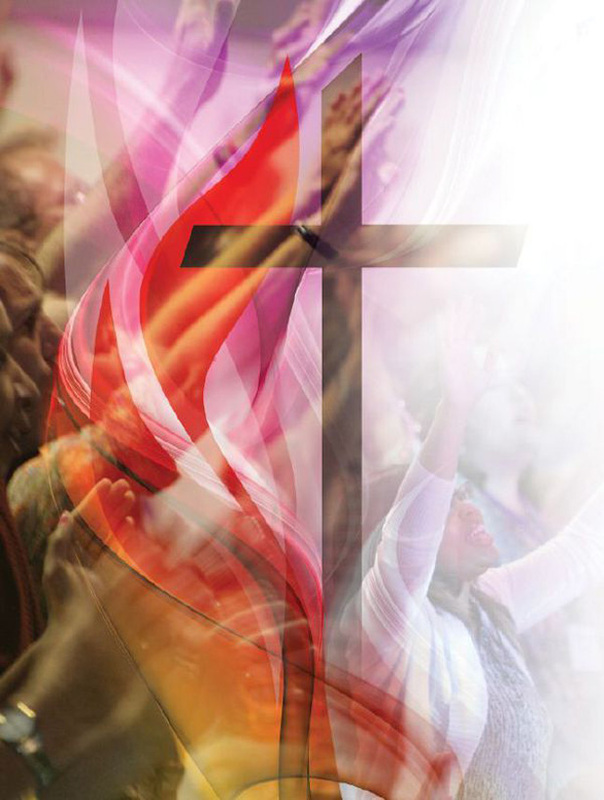 Where are you offering service THROUGH the body of Christ? A healthy disciple is one who gives service TO the body, and offers service THROUGH the body. Yes, a healthy disciple also worships, and gives, and studies, and evangelizes, but a disciple is not a disciple until a disciple also serves. Yes, it’s that important. It absolutely MUST be part of the culture of the 21st century congregation. I think it’s time we get our service on! 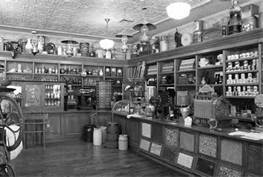 I grew up in a General Mercantile store. For those who may not know what a General Mercantile is, it’s Wal-Mart before Wal-Mart was cool (that’s assuming Wal-Mart was EVER cool!). It was the store in the small town where a person went to do one-stop shopping. My grandfather owned the store. I believe that store had more to do with shaping me as a person than perhaps anything else. The General Mercantile was a magical place. There were endless opportunities to explore, there were endless people to encounter, there were endless places to hide, there were endless stacks to pilfer. One end of my grandfather’s store was reserved for hardware. One side was reserved for dry goods (clothes, shoes, small kitchen appliances), the back was reserved for feed and seed, and the front, well, that area was reserved for groceries. At one time, my grandfather even sold radios and televisions. He had an old workbench in an area between the feed and seed department and the meat market where he worked on televisions and radios. I spent my growing-up years hanging around the store. After school often found me at the store (if there wasn’t ball practice). Saturdays were spent at the store. When I reached the age of 12, Pa put me on the “payroll,” and I “worked my way” through school. Almost every Saturday was spent as a bag boy at the store. If there weren’t groceries to bag and take to people’s cars, I could generally be found sporting a broom sweeping up dirt. It was dusty in that old store–it sat on the main street, and the door was kept open from April – September. Every time a car passed on the main street, the wind brought dirt and dust blowing into the store. Wow! Saturday was a busy day! In those days (ha! I feel old saying that! ), people came to town on Saturday. Having lived in Monroe the past two years, and in places like Benton, Minden and Morgan City, previously, it’s funny to think of people coming to Chatham and thinking they were “going to town,” but I remember growing up when a trip to Monroe was a once a month thing, and that was often only to go to the doctor or hospital. Heck, when I was young, there was even a doctor in Chatham. The streets of our little town (Chatham) would be lined with cars on Saturday. There were two other grocery stores in town at the time, but none had the extensive selection of items my grandfather had. There was also a barber shop, the bank, the City Café (which was a converted movie theater) and three gas stations in “downtown” Chatham. The town was abuzz with activity, and I can remember just wishing for 5:00 p.m. (I guess we’re born with that gene, huh?). Life in the General Mercantile shaped me more than probably anything else. How so? I love people. There is little doubt in my mind that my love for people is deeply rooted in my time spent at the General store. I love to hear people’s stories, where they’ve come from, where they’ve been. I love to hear the lies they tell, the tragedies they’ve experienced, and the success they’ve attained (both real and imagined). There was an old stove that sat in the middle of the General store. In the wintertime people would gather around the old stove and tell all those stories. I learned to listen to those stories. I learned to love those stories. I still do today. I catch myself all the time asking people, “Where are you from?” or “What do you do for a living?” That curiosity is borne out of meeting people in that old store. I also learned how to treat people in that old store. Across the street, in the City Café, there was still a front door and a back door. There was a front counter and a back counter, if you get my meaning. Yeah, it was the 1970’s, and things were still a bit confusing in the small town. Not at the General Store. There was one door, well, there was the front door and two back doors. One back door was where we loaded out the appliances and other big ticket items in hardware and dry goods, and the other back door was where we loaded out the feed and seed. Everyone with money came through the front door. There was no black or white at the General Mercantile. The only color that mattered was green. My grandparents treated every customer the same, with the same respect, and with the same courtesy. I learned my work ethic in that store, too. One of the legacies my grandfather left me (well, all my grandparents–okay, my parents, too) was a strong work ethic. He ran that store six days a week from 7 a.m. – 6 p.m., and he got up on Sunday morning and used the excuse of going to check on the “cold” boxes to go to the store. He was there on Sunday from around 8 a.m. – Noon. It was his way of getting around the “blue” laws in those days (there’s that phrase again). He wasn’t technically open, but he never turned anyone away who happened to knock on the door while he was reading the paper and “checking” on the coolers. He worked all his life. He was big on customer service. I often think my attentiveness to a person’s experience when they come to the church is driven by watching and learning customer service from my grandfather. There were probably a few less-than-stellar lessons I learned hanging around that old store. Entitlement is one that comes to mind. I’ll just say it. My brothers and me, and our cousins were spoiled by that old store. We had run of the place when we were there. There was an old Coca-Cola machine (boy, wish I had that now!) that stood in the front corner. It wasn’t a vending machine. It had the door that opened, you pulled out your favorite beverage, and took it to the counter and paid. My brothers and cousins didn’t have to pay. Any time we wanted a drink, we got one. That simple. Not good! The same with the candy counter. There was a big glass case that sat right at the front door. You actually had to go around it to get into the store. It was filled with all types of candy and other sweet treats. Throughout the day, we simply walked by and picked up what we wanted. Pa or Mama Kit never said a thing. There’s no telling how much we cost our grandparents in sodas and candy. We couldn’t wait to get out of school everyday so we could go by the store and get a cold soda and a candy bar. It spoiled us. I can tell. Our lives are shaped by all our experiences, both positively and negatively, often from the same experience. Those experiences have made us who we are. God has used them to shape us. He has used the experience of the General Store to nurture my love for His people. He uses the experience of the General Store to gently call me to accountability when greed and a sense of entitlement start to drive my decisions. I suppose it’s another way “that God causes all things to work together for the good of those who love Him and are called according to His purpose for them” Romans 8:28 (NLT). Don’t know why, I just woke up in a nostalgic mood this morning. I loved that old store! Vanessa and I once took ballroom dance lessons. It was fun. We learned the basic steps for the foxtrot and the waltz. I can still hear, “slow, slow, quick, quick,” and “1, 2, 3, 1, 2, 3…” in my head, and I can sort of remember how our feet are supposed to move, but I’ve really lost most of what we were taught. Part of the problem? We never actually went ballroom dancing. We just learned the steps. I don’t feel like I was very good at ballroom dancing. I felt stiff when I moved. I felt like I was always searching for a rhythm and never quite finding it. I’m not sure if that means I have no rhythm, or I didn’t try long enough to discover I did. 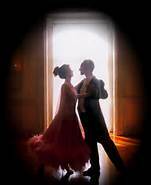 Life for me right now feels a little like I’m trying to ballroom dance. It’s lacking rhythm. That’s one of the things change does for us–it throws off our rhythm, it breaks our routine. That’s a bad thing for me. I’m one who does best with a routine. I suppose I should be out-of-step just a little. Let’s see, moving to a new home, taking a new job, meeting new people. Yeah, there’s been just a little change recently. I need to cut myself some slack, right? I am. I’m not trying to be too hard on myself for being out-of-step, I’m just processing how uncomfortable it feels. I feel stiff. I feel like I’m searching for rhythm. I feel like I did when I was learning how to ballroom dance. I remember feeling the same way two years ago when I left the local congregation to become District Superintendent. Now, there’s a job with no rhythm to it. The travel demands make it difficult to cultivate a routine that is stable enough to call a routine. Eventually, though, the routine of no routine became easier to manage, and there was some rhythm that flowed from the job (even if it was just the rhythm of always packing the suitcase–I actually got pretty good at throwing things in a suitcase). It just took time. There’s a big difference in reading the Bible devotionally and reading the Bible critically. I’ve read the Bible devotionally (almost daily) for the past two years. Critically, not so much. Sermon preparation and weekly Bible study preparation keeps the critical skills honed. Though I have written a few sermons over the past two years, I’ve not prepared one Bible study. I’ve got to reengage those critical skills again. I’m actually expected to lead a Bible study in church. Can you believe that? I’ve got to re-discover the dance, the routine, the rhythm of that kind of study and preparation. I really am out of the habit. Should I be confessing that? Okay, here’s another confession. I’ve been pastor for a week now. I’ve found myself sitting at my desk asking myself the question: What am I supposed to be doing? I know I’m supposed to be doing something, but I haven’t quite figured out what it is. I know it’s because I’m searching for that rhythm. I know it will come. It just takes time. And practice. Like ballroom dancing. The more you do it, the better you get at it. Yes, I was much better when we completed the lessons than when we started. I actually felt like I could learn these new dances, that I really could, given enough time, be graceful, be light on my feet. I’m also reminding myself that the staff, the congregation, and even Vanessa and my family, are all learning a few new steps, too. The staff and the congregation are learning how to dance with me as I’m learning how to dance with them. Vanessa and my family have me as their pastor again. That’s a reclamation of an old role, but it’s a new dance for them. So, we’re all searching for that new rhythm. We’re all learning a few new steps. We’ll misstep along the way, but eventually, it’ll click. We’ll get in step and the result will be beautiful. It will be a graceful dance that will have eternal implications. So, strike up the band! Let’s dance!